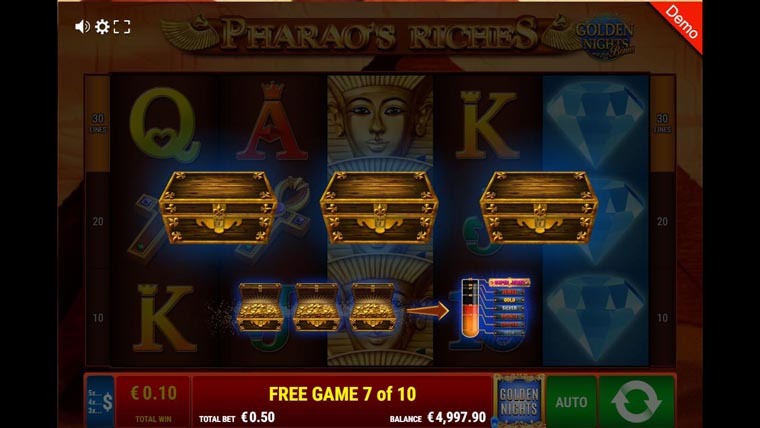 Pharao’s Riches Golden Nights is a new video slot from Oryx that will take you back in time to Ancient Egypt where you get to storm the pyramids and get your hands on the pharaoh’s gold. The five reels, three rows and 30 paylines slot has access to the Golden Nights Jackpot which means that with an additional bet you get to activate it and it can trigger a jackpot side game on every spin. You will get some chests and if they are all filled you get to the draw when the collected points on the reels fill the thermometer and determine your jackpot win. You can also get free spins if you land at least three pyramid scatters. You can win up to 100 free spins. During the free spins bonus round the diamond scatter will appear stacked on the reels. Why play it: You can win up to 100 free spins which is amazing, and the added stacked wilds can only help. On top of that the Golden Nights jackpot feature can take things to the next level if you’re lucky.